Even when children don’t see domestic abuse, they usually know it’s happening. It can affect them deeply. More than 50% of women experiencing domestic abuse live in households with children under 12. 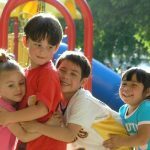 These children are more likely to exhibit behavioral issues and physical health problems, including depression, anxiety, and violence toward peers. Through the Hal Herman Children’s Fund (HHCF) and the generosity of donors, the smallest survivors of domestic violence can receive the support they need — supervised care while their parent is in counseling, and help from specialized therapists that use play therapy, art therapy and more to help these children break the cycle of domestic violence. To learn more about the Hal Herman Children’s Fund and the HHCF Celebration Wall.